“Since HTG put on the new roof the difference is amazing. 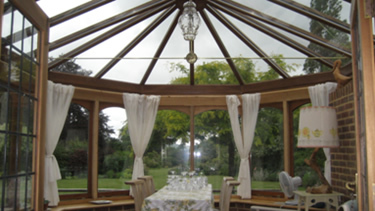 My conservatory is now usable throughout the year”. 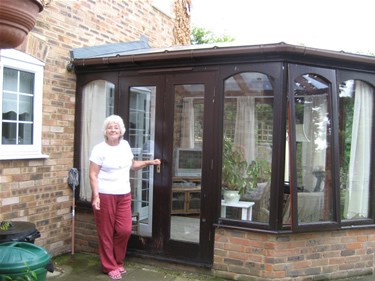 After: Mrs Oliver outside her refurbished conservatory. 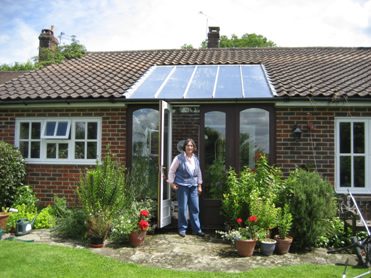 When Mrs Oliver moved to her Kent home, any dreams she had of spending a great deal of time in her conservatory soon vanished. 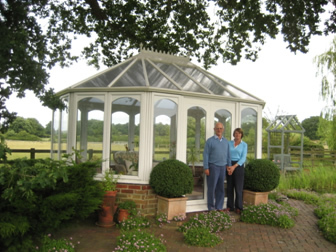 She thinks the mahogany conservatory is probably 18-years-old, and the roof was showing definite signs of old age. Not to put too fine a point on it – it leaked like a sieve as some of the roof panels had slipped. As it wasn’t a modern roof, the air space between the panels had never been as wide as modern ones – a larger gap provides better insulation. 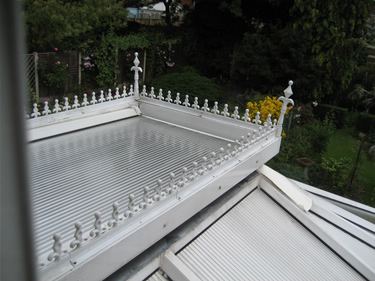 HTG fitted a high performance polycarbonate roof, which has the added advantage of heat reflectors, which help keep the conservatory cooler in summer and warmer in winter. 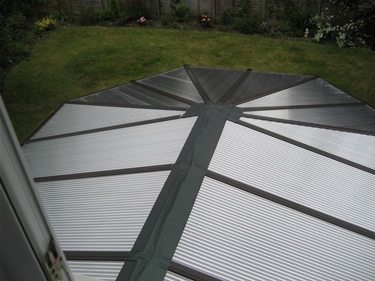 After: the conservatory roof with new HTG polycarbonate panels and lead flashing. “When I moved in the roof leaked so badly I had to have pots on the floor to catch the water, and my elderly Labrador used to sit in them,” explained Mrs Oliver. “The roof was so thin there was virtually no insulation and it was desperately cold in winter, despite having double-glazed walls. “Since HTG put on the new roof the difference is amazing. My conservatory is now usable throughout the year. 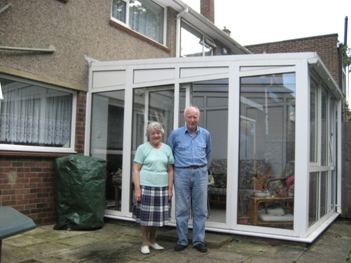 “My lounge doesn’t get any sun from midday onwards, so the conservatory is a much nicer room to sit in as it is much lighter. It is cooler now in the summer, but it is in the winter I really notice the difference. 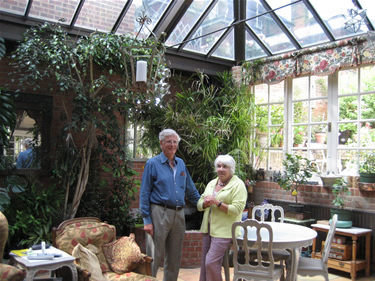 “I put on a small low-watt heater and the warmth it generates seems to stay in the conservatory. “The men that put on the new roof were amazing. They arrived in December on a desperately cold day, but they just plugged on and got the work done with the minimum of fuss or mess. 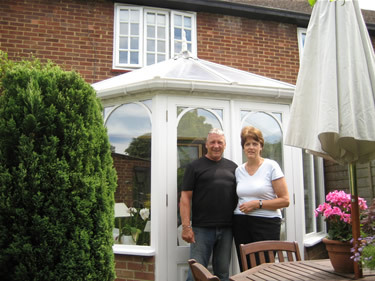 “That meant I had the conservatory to use at Christmas.